I don't have a strong background in art, so I'm always looking for ways to bring art into the house that will help me encourage my kids to appreciate art and enjoy artistic endeavors without a lot of work or background knowledge from me. Recently, we had the opportunity to review Master Kits The Starry Night. This is a product of Kidzaw.com, which makes creating masterpieces easy and fun for kids! I used it for an evening project with my three and five year old girls! My five year old is especially artistic and enjoys all things arts and crafts, so I knew this would be an exciting project for her. The Starry Night kit comes in a sturdy box with magnetic closures so you can store supplies, and includes acrylic paint, oil pastels, rollers (including the specialty van Gogh roller), stencil, art paper, star stickers and the Van Gogh learning booklet. Also, an instructional booklet is included. The only thing I added to our session was a cheap tablecloth to cover the table, a paper plate for the paint, and tape to hold the paper in place, as well as an old t-shirt for my three year old. Everything came neatly rolled in the box, so it was protected, but you might want to flatten your paper and stencil under heavy books first. I didn't do this first, so they were a little difficult to handle for little hands. If I'd though about it before showing the girls the kit, I would have definitely done this a day or two ahead. Otherwise, set up was easy and straightforward. The instructions are written out with picture guides, so they are easy to follow. I read them aloud, because I wanted the girls, or at least my Kindergartener, to understand what and why we were doing certain steps. I helped the girls set up and get through each step, but an older child could do this independently. To get started, you need to tape the paper down, place the "star" stickers on the paper, and then use the rollers and stencil as instructed. I let the girls do this together, but that meant there was a lot of back and forth for me as I helped them through each step, and managed supplies. I would think ages 10+ could do this independently, while younger students will need varying amounts of assistance based on reading level and fine motor skills. While there is enough paper for two projects, and probably enough paint for more, there is only one set of the star stickers and rollers. That means I had to improvise. I used the perforated part under the original stickers since they were the same shape, and my three year old didn't care. By starting one child ahead of the other, I was able to go back and forth as one child moved to the next step, they could pass the roller to their sibling. I just had to find a good rhythm. Of course, one child could have waited for their sister to complete the entire project, but that's difficult to do at their age, so I did my best to accommodate both within my ability. Once they finished the painting part, it needed to dry. You could speed up the drying process with a hair dryer, but we just went and played, and came back later. After the paint is dry and the star stickers removed, the kids are taught how to use the oil pastels to fill in the stars and the city landscape. They're encouraged to make it their own, so they can "be inspired" by the original work, or they can get creative and imaginative. My 3 year old wasn't particularly interested in the details, but she really enjoyed the overall process. 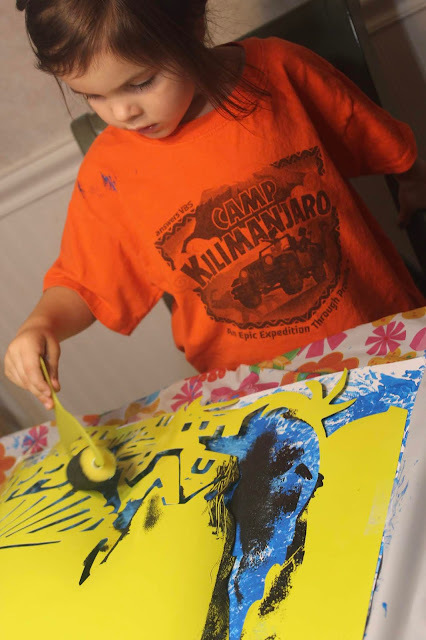 At this age, it is just great to expose her to famous paintings, and the idea of enjoying art, and recreating it in a fun way - the rollers and stencil were exciting for her! My 5 year old really enjoyed filling in the little details and blending colors . . .
She also took it to heart to get creative with hers. Both girls were very proud of their finished product, and have them hanging over their beds now! The informational booklet about Van Gogh is a nice, child-friendly introduction to the artist and some of his works. You could read this before you start, during the project itself, or they could read it independently. We just looked through it and I told them a few key facts. At their age, that is enough to interest them, without overwhelming them with facts. Overall, I am pleased with the Master Kits The Starry Night. The instructions were detailed and easy to follow, the artist information was appropriate for kids, and the activity itself was fun! There are several more Master Kitz and other fun products from Kidzaw.com, and I am thinking my five year old would love for me to add these to her gift list for Christmas or her upcoming birthday! I really do think they make unique gifts for young artists to help them learn about different techniques and to build an appreciation for master artists. There is also one "Art Party" set designed for 12 children - I think it would make a great birthday party activity or co-op session! If you're interested in learning more about this fun little kit, be sure to read more crew reviews!